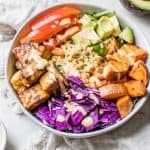 A super flavorful and seriously satisfying Thai Tempeh Buddha Bowl, packed with nutritious foods and drizzled with a simple cashew curry sauce. Great for meal prep, vegan and gluten-free friendly. For the tempeh, I like to chop into cubes and let marinate in mixture of 2 TBS coconut aminos (or tamari/soy sauce), 1 tsp sesame oil, and 1 TBS rice vinegar for about 10 minutes. Cook tempeh in medium frying pan on medium heat for about 10 minutes, until golden and crispy. While tempeh is marinating, start the freekeh by placing 1/2 cup freekeh and 1 1/2 cups of water in medium saucepan on medium-high heat. Bring mixture to a boil, then cover and simmer for about 20 minutes, until water has evaporated. To make the sauce, add cashew butter, coconut milk, coconut aminos (or tamari/soy sauce), rice vinegar, and red curry paste in a small bowl and whisk vigorously until combined. In a medium serving bowl, add mixed greens, cooked tempeh and freekeh, layer in veggies, and top with curry sauce. This bowl is best eaten fresh, but leftovers will keep in fridge for a couple days.